Are you running a ArmA2/DayZ Mod server? PLEASE sign this. Hello, as many of you probably know there is a vulnerability in ArmA2 making servers easy targets for hackers/cheaters. Please up-vote this issue here: https://dev.withsix.com/issues/75896 so we might get an end to the create unit exploit. Hello, as many of you probably know there is a vulnerability in ArmA making servers easy targets for hackers/cheaters. Please up-vote this issue here: https://dev.withsix.com/issues/75896 so we might get an end to the create unit exploit. Theres some exploits that are a lot worse than atm. At first I was posting a tongue-in-cheek comment along the lines of "lets get this fixed so arma2 can be hacker free" but after looking at this, it appears ... well .. it appears it will be maybe considered a new "feature" of arma2 since its basically ignored. I am not very familiar with that site but am I reading it wrong? But when I click on all the issues .. that isnt listed? So its been reported (2 months ago in Arma3 and again 10 days ago for Arma2) but its not officially acknowledged? Is that what I should take away from this? 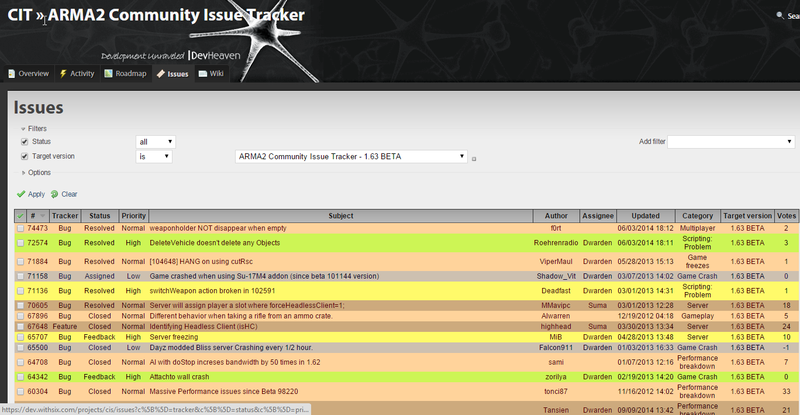 found it in "open bugs" .. but if its not in the issue tracker with a dev assigned then it is basically being ignored .. ? should have read this a long time ago .. who needs hacks when you can just glitch all day long!